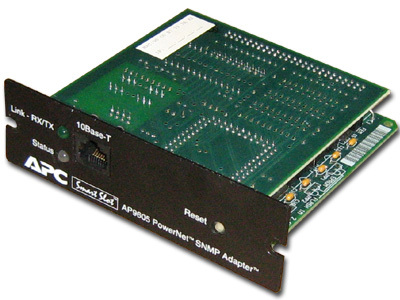 The APC AP9605 PowerNet SNMP Adapter is a SmartSlot accessory which was sold by APC for their UPS products (it has since been discontinued in favor of newer/more advanced cards). Basically, is a 10 Mbps ethernet adapter which allows the UPS to communicate via SNMP instead of having to use a serial cable connected to one computer. 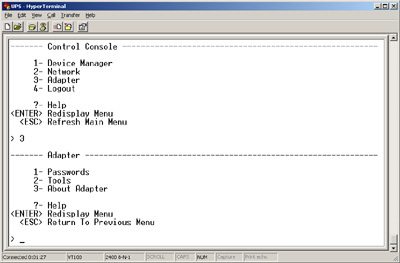 The benefit of this is that multiple computers/servers can query the UPS directly, instead of having one "master" server which is connected via a serial cable with which the other computers must communicate. The default username/password for these cards is apc/apc. One drawback to purchasing one of these cards used is that sometimes a previous user has changed the default username and/or password. If you cannot log in to change the networking configuration and such, the card is useless. One option which is available to you is to simply contact APC's customer service department (their web site is www.apc.com). 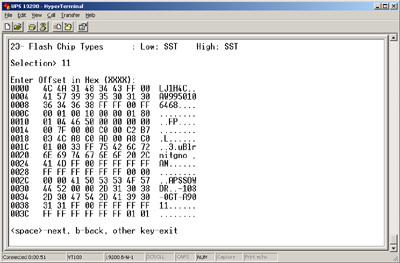 If you give them the card's serial number, they can provide you with a backdoor password. When you log in with the username of apc in conjunction with the backdoor password, the username and password will be reset back to apc/apc. This is probably the easiest option, but if you are in a hurry, or just like doing things yourself, this page describes how to determine the username and password for your AP9605 card and also how to reset it. Press the "off" button on the UPS again, only this time, hold it down until you hear a click. This will take about 3-5 seconds. Remove the screws and cover from the SmartSlot port, if necessary. Install screws to secure the card in the slot if you are leaving it there and putting the UPS into use, otherwise if you are just testing or will be pulling cards in and out frequently, the screws aren't necessary for it to work, just make sure the card is fully seated. 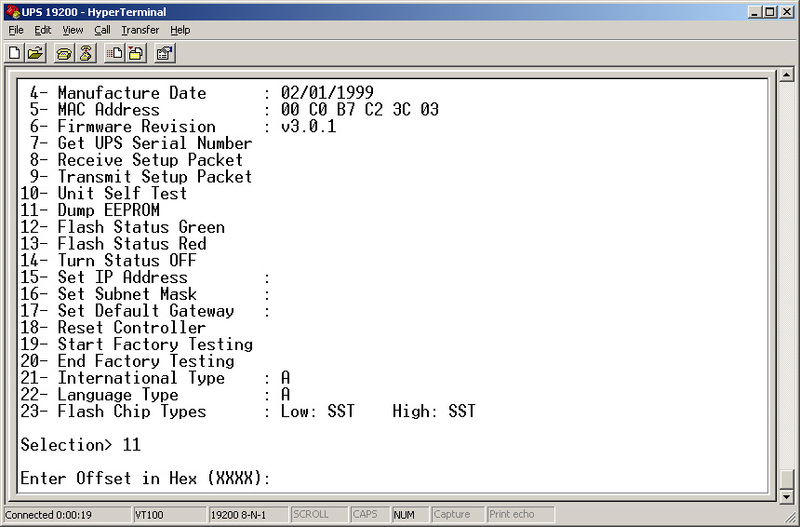 There is no need to connect an ethernet cable at this point, the configuration will be done via the serial port. Plug the UPS back in. (You don't need to press the "on/test" button, just plugging in the UPS is enough to power up the SmartSlot port and allow you to establish a serial connection. In addition, the female end should have sockets 1 and 4 connected ("shorted") together, and the same for sockets 7 and 8. When you connect, you need to hit "enter" a couple of times and you should be presented with a "User Name" prompt. 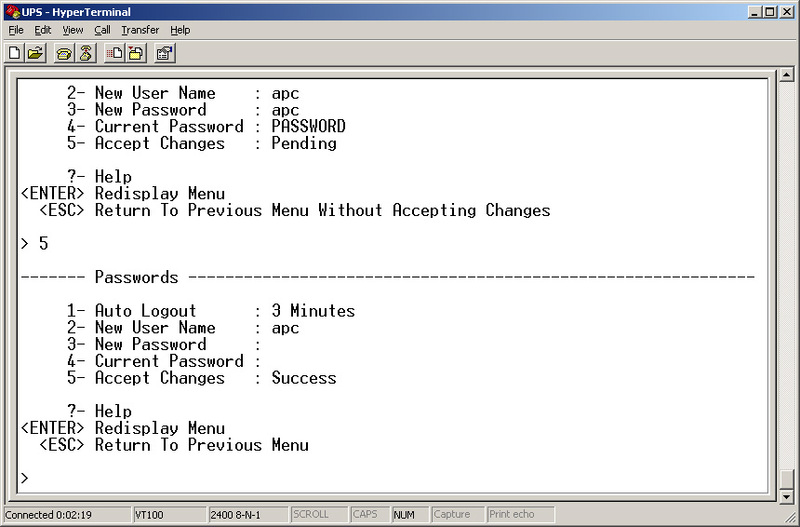 The default username is "apc", and the default password is also "apc". If you cannot log in with those, then somebody has changed the username, password, or both. The rest of this guide explains how to retrieve this information. 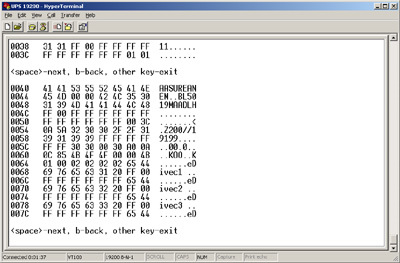 APC built a "back door" password into the AP9605 which was apparently used for factory configuration. 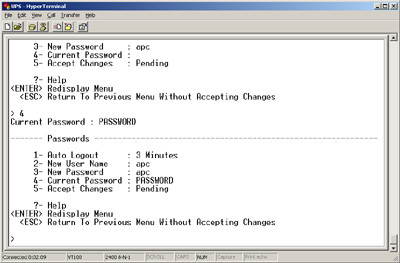 When you log in using this back door password, you are presented with a different menu than when you log in with the normal password. 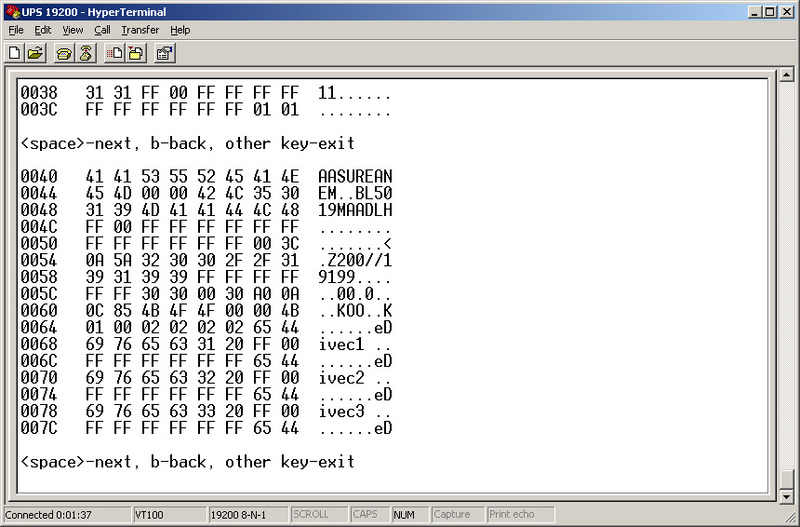 One of the options on this menu is to dump the contents of the EEPROM, and fortunately, this includes the username and password. I will now take you step by step through the process. 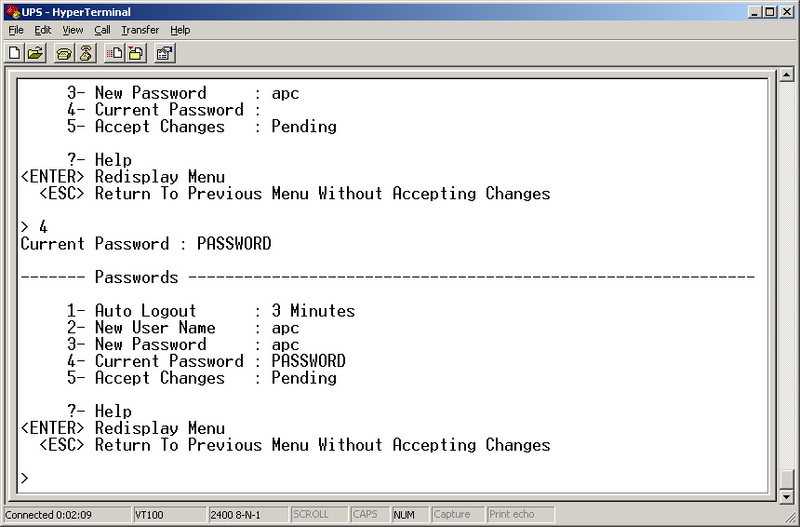 In this example, the UPS has been configured with a username of "USERNAME" and a password of "PASSWORD". After you connect to the UPS with your terminal and get the "User Name:" prompt, type anything you want for the username (it doesn't matter), then for the password, use "TENmanUFactOryPOWER". (Cut 'n paste is your friend here.) 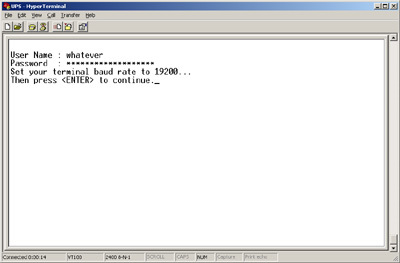 You will be prompted to change your baud rate to 19,200, as shown to the right. Disconnect, change the baud rate for your comm port to 19,200, connect, and then hit enter. You will be presented with the menu shown to the right. There are a bunch of options here obviously, and it looks like there is potential to mess up the card by choosing the wrong ones, so its probably best to not mess with any option if you aren't sure exactly what it does. The option we are interested in is number 11, "Dump EEPROM". Choose that, and you will be presented with a prompt that says "Enter Offset in Hex (XXXX):"; just hit enter here. 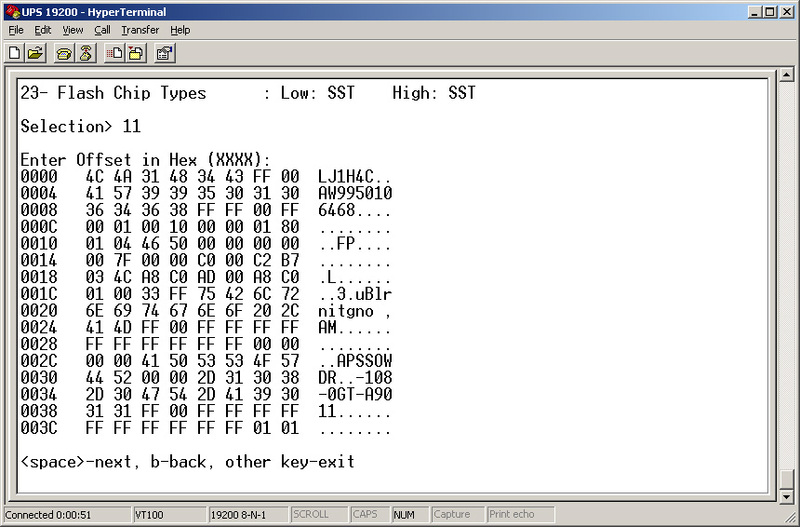 Once you do so, you will be presented with the hex dump, one page at a time. Hit the space bar to go to the next page, "b" to go back a page, or any other key to exit the dump and go back to the menu. 9 Line 0030, column 4 . 10 Line 0030, column 3 . 9 Line 0044, column 4 . 10 Line 0044, column 3 . A note for AP9606 users: I received an e-mail from a Mr. David Fulmer who informed me that this procedure also works for the AP9606, however the username starts at offset 0x01D3 and the password starts at offset 0x01DE. Thanks, David! Once you've got the username and password, go back to the main menu and hit CTRL-A to exit the factory backdoor menu. 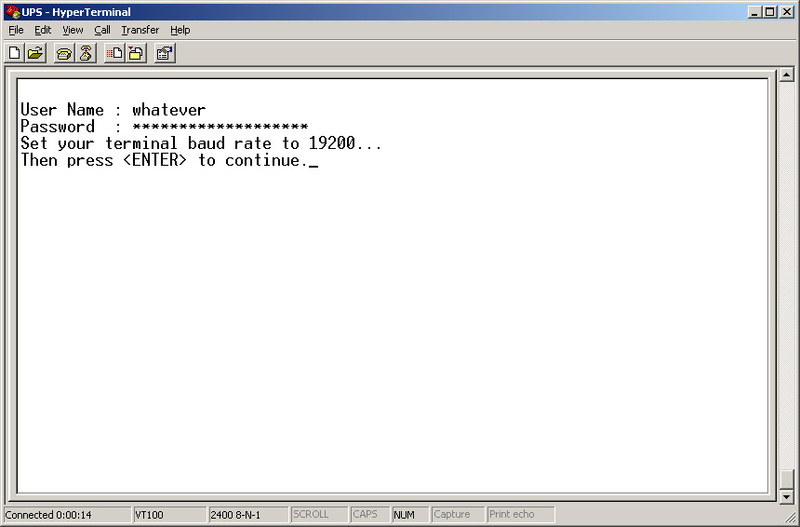 At this point, it will prompt you to change the baud rate back to 2400. Use the same procedure as before - disconnect, set the comm port to 2400 baud, reconnect, and hit enter. Now that you know the username and password, when you connect to the UPS with your terminal program and are presented with the username and password prompts, you can input the correct values. Once you are logged in, you can reset the username and/or password to those of your choosing. To do so, choose menu option 3 ("Adapter"), and then menu option 1 ("Passwords"). 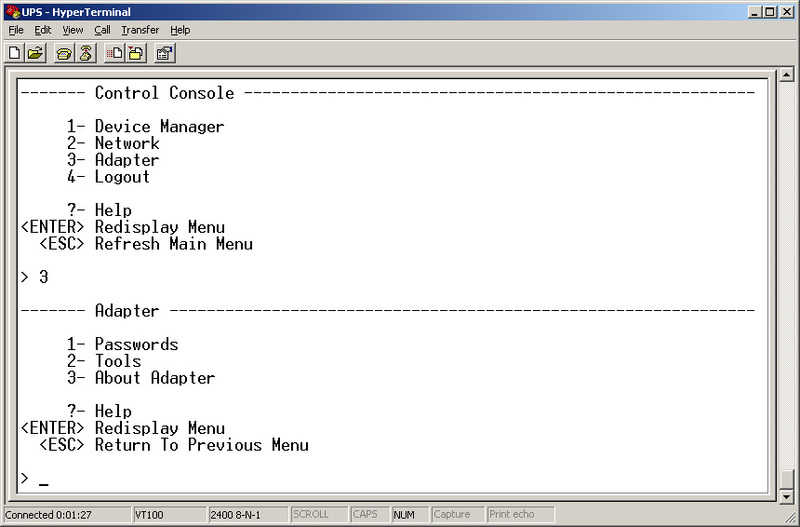 On the menu which is presented, if you want to set a new username, choose option 2, then type the new user name. Use option 3 to input a new password, and then choose option 4 and input the current password (the one that is currently set in the card, the one you just used to log in). Once you have input the values you want, choose option number 5 ("Accept Changes"). 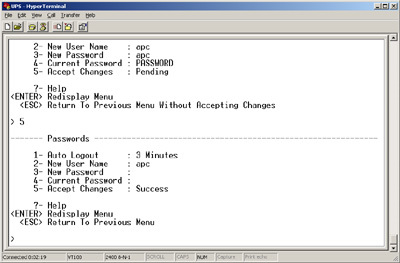 After you choose menu option 5, if you have entered the correct value in the "Current Password" field, menu option 5 should change from "Pending" to "Success". At this point, you can escape back to the main menu and log out. You should now be able to log in using the new username and password you have chosen; give it a try. Congratulations! You've just turned an expensive paperweight into a useful piece of networking equipment. If this page has saved you some money, time, and/or frustration and you feel like expressing your gratitude in a monetary form, I would certainly not be beneath accepting a donation of whatever amount you feel is appropriate. I can accept a PayPal payment to jon@jonsteiger.com.